Originally published in The Rye City Review, June 18, 2016. For Stew Latwin, the hardest part was keeping a secret. 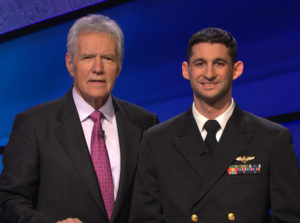 After filming multiple episodes of the popular television quiz show in March, Latwin, a former Rye resident, was contractually obligated to keep the outcome of his “Jeopardy!” debut to himself until its national broadcast more than two months later. On June 6, friends and family across the country finally got to watch Latwin appear as a contestant on the nationally syndicated show and capture a total of $44,601 in winnings across three episodes, two of which he reigned as champion. One of the longest running game shows in television history, “Jeopardy!” is comprised of general knowledge clues in the form of answers, to which contestants phrase their responses in the form of questions. The clues cross a wide variety of topics, including history, current events, science, popular culture, literature and languages, and are categorized by topic or theme. Each category contains five clues, valued incrementally between $200 and $1,000. The contestant who rings in their answer using a handheld signaling device the fastest gets the first chance to answer the clue. However, unlike most television game shows where contestants are selected at random, “Jeopardy!” has an extremely difficult and competitive application process. “I’ve been applying for years and finally, everything just came together,” Latwin said. Latwin, 30, first took an online test in January 2014; a 50-question exam where applicants have only 15 seconds to type in the answer. After achieving a high score, Latwin was called to audition in June of that same year in Washington, District of Columbia, however he didn’t receive that long-awaited phone call until February 2016 when a show producer asked him to appear as a contestant the following month at Sony Pictures Studios in Culver City, California. Latwin explained that with only a month’s notice, it was nearly impossible to prepare for the show’s wide range and depth of topics, which forced him to draw upon his years of experience as an avid “Jeopardy!” fan and frequent trivia competitor. Looking back on his time on set, Latwin described a nervous energy around the studio, while also noting that despite the intense competition, everyone was friendly toward each other, even the more intense competitors. With his winnings, Latwin intends to help pay for his upcoming wedding later this year and pay off graduate school, as well as take a few vacations. “It was very exciting and cool to see the filming and be part of a show I’ve grown up loving,” he said.